What kind of world would we live in without gravity? A phenomenon defined as a force by Sir Isaac Newton, something which attracts all objects to other objects, with Albert Einstein chipping in with his theory that gravity is the result of the curvature of space-time. These two theories are the most widely accepted, and although we may never get a fully complete explanation of what gravity actually is, we all know it’s a pretty awesome phenomenon nonetheless. So just what happens when you take a magnificent iPhone, iPod touch or iPad, jailbreak it using one of the excellent tools provided by the development teams and then give it a serious dose of internal gravity? Well, a great device becomes an amazingly fun device as you sit and watch your application icons cave under the 9.8m/s2 force of gravity. We are pretty sure, most of the seasoned jailbreakers have come across the Graviboard tweak by young developer Conrad Kramer, which has been available in the Cydia store for quite some time. Graviboard basically applies gravity to the iOS device’s SpringBoard, through the use of a user defined Activator gesture, which when invoked causes all application icons to succumb to the force of gravity and fall from their mantle. Not only is Graviboard a beautiful and fun aesthetic tweak but it also has some extremely polished touches, like making sure that the icons follow the orientation of the device using the accelerometer feedback to animate the icons around the screen. Users can also use their finger to ‘throw’ the icons around the screen making sure the device’s SpringBoard is in total chaos and disarray. Graviboard also comes with a powerful preferences entry which allows a number of settings to be tweaked to suit individual tastes. 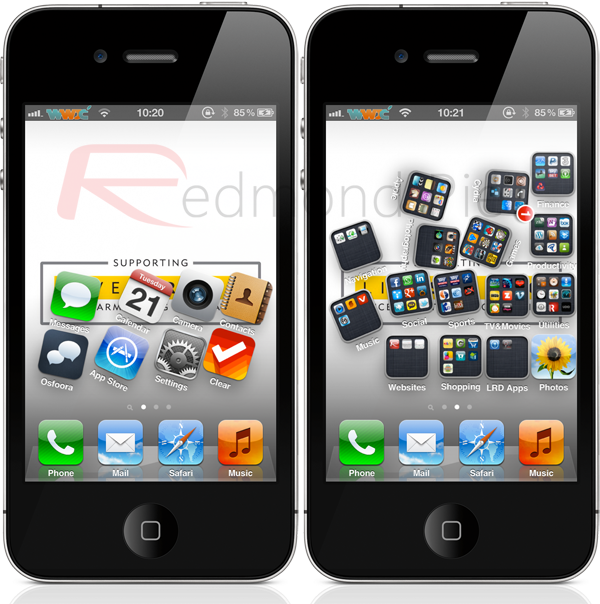 Users can define which Activation method they would like to use to begin, as well as whether the tweak is automatically enabled, whether or not page swiping is available, whether the docked icons are to fall under gravitational pressure and whether or not the applications can still be launched. There is also an additional simulation settings entry in the preferences panel which allows the amount of gravity to be applied which on the other hand can be fine tuned, and the bounciness of the icons when they come up against resistance and the levels of friction applied. The best news is that Conrad Kramer has released Graviboard version 2.0-1 which has full iOS 5 compatibility as well as multitouch support, and adding some additional preferences entries to give more powerful user control. Graviboard is by no means an essential tweak which brings must-have improvements to iOS, but with that said, it is on my personal list of first installations whenever I jailbreak my device. It is a truly remarkable example of a great, fun idea which fuses together a complex blend of mathematics and some highly complex, behind-the-scenes code. I get excited every time I see the icons fall and I recommend you try it out. Graviboard is available from the Big Boss repository at a cost of $2.99 or as a free of charge upgrade if you have already purchased this tweak.